It's been a bad year to be a mosquito. The world's most annoying insect is responsible for 250 million cases of malaria per year  and 1 million deaths. But scientists at the University of Arizona have genetically engineered a mosquito that's immune to the Plasmodium parasite, the malaria-causing agent it transmits with its bite. The next step is to make the new mosquito hardier than the ordinary kind, then release it into the wild (perhaps within 10 years), where it will displace the deadly variety. Meanwhile, former Microsoft exec Nathan Myhrvold, working with the Intellectual Ventures Laboratory, is developing a laser that can zap mosquitoes without harming other insects or humans. 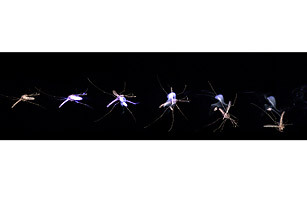 The laser targets the mosquitoes' size and signature wing beat and sends the bugs down in a burst of flame, making their deaths good for public health and, well, kind of cool. Correction: The original version of this story misstated that former Microsoft exec Nathan Myhrvold was working on the mosquito laser photonic fence with the Lawrence Livermore National Laboratory. The fence was created at the Intellectual Ventures Laboratory in Bellevue, Wash., where Myhrvold is CEO.